JULIA SPENCER-FLEMING: It used to be called Blue Monday. 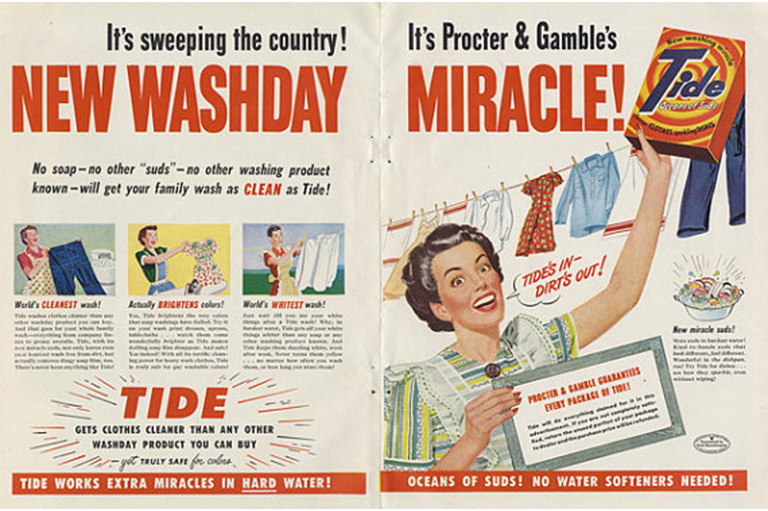 For centuries in the western tradition, Monday was laundry day, a day-long arduous series of tasks involving heating water over a fire or a a coal burner, pouring it into a literal tub with the dirty clothes, scrubbing - by hand, over a washboard, or against stones - rinsing in water that until the advent of indoor plumbing had to be pumped and toted, wringing and hanging up on bushes, a clothes line, or a wooden rack. People didn't have as nearly as many clothes as we have today, and I don't think it was just because of the greater cost. Can you imagine doing this with everything in your weekly laundry basket? Which leads me to my recreation of ye olden days. The electricity in my upstairs bath/laundry room has gone kaput. (See episodes 1 - 80 of Julia's Old House for similar incidents.) I already did all the easy stuff to check for the problem, and nothing worked. I've been dragging my feet on calling the electrician, since I suspect it's going to be a pricey job. Not having a light over the sink isn't really an issue - the bathroom is Jack and Jill style, opening onto my bedroom and what used to be the Smithie's, and with lamps on in the bedrooms, I can see to brush my teeth and wash my face just fine. But the washer and dryer don't work. Some of you with keen memories may remember me talking right here about how I virtuously hung up all my laundry, saving on electricity and being green, etc., etc., but the truth is, with only one adult in the house to get everything done, I leaned heavily on that dryer all last year. But sure, yeah, I can, if necessary, do without a dryer. But not a washing machine. I've had friends who have stepped in during my slow-motion crisis, which has enabled me to experience different aspects of the laundry life c. 2018. One friend invited me to dinner and had me toss things into her stacked super-efficient washer-dryer tucked into a corner of the downstairs bathroom. Another who who is genuinely green and living off the grid with solar power let me use her washer on a sunny day and hang my clothing and sheets on her professionally equipped outdoor line - thirty feet of returning cord, kept from sagging by a series of clip-on pullys and three hanging bags of clothes pins. Like my grandmother did back in the day, this friend steps out onto her back porch and hangs everything up from there, wheeling it out and in over the course of a day. Another friend, living in a more suburban environment, has an actual laundry room. I've never had one in my life and I'm filled with envy. She has a counter over the washer and dryer at exactly the right height for folding clothing (I fold mine on the dining room table...) and a pull-down sweater dryer and an ironing board in a narrow cupboard. SO AWESOME. And, of course, I've also used a laundromat for the first time in decades. I had forgotten how much I actually enjoy the experience. The one I went to was very clean and bright, with stacks of the latest magazines in a little sitting area and free wifi. It was a pleasantly enforced time-out for reading, and there's something bracing about getting ALL the laundry done at one swoop, drying it, folding it, and being on your way. No clean-but-unfolded pile sitting in a basket in the bedroom, making you feel guilty. No half-load building up in the hamper. My laundry styles of the modern American landscape tour has been interesting, but I think it's time to bite the bullet and call in Joe the Electrician. 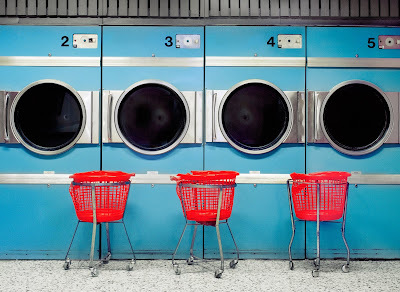 In the meantime, Reds, what's your laundry day like? 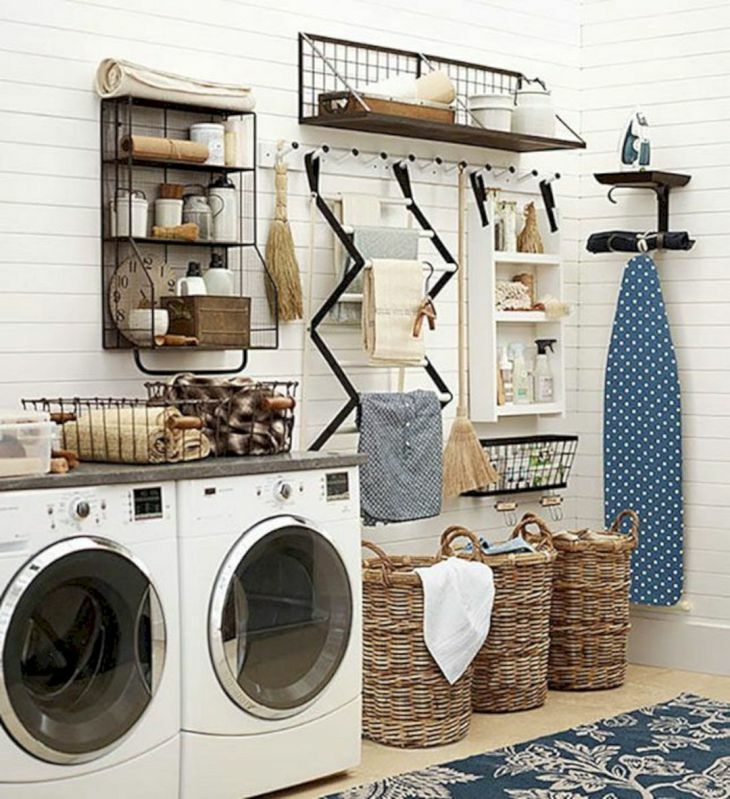 Do you have an actual LAUNDRY ROOM? Does it really make the chore a pleasure? DEBORAH CROMBIE: Julia, we do have a laundry room off our master bathroom (master bathroom sounds much grander than the actual thing in this old house...) but there is just room for the washer and dryer, which face each other, with a rolling hamper squeezed in between. There are some hard to reach shelves over the machine, and the folded ironing board is squeezed between the dryer and the wall. Clothes are folded (when they get folded) on the bed. I try to do laundry on Sundays, but almost never finish it and will have one load or another sitting in the dryer most of the week. I do actually kind of like doing laundry, however. It's a task that can be satisfyingly completed in a reasonable amount of time--unlike writing a book. When I stay in my favorite hotel in London I take my clothes to the laundrette, as they say, and I like doing that. An hour to read or make notes or people watch, and then everything is done and folded. But when I moved to Scotland years ago and lived at first with my husband's parents, his mom had a washing machine like nothing I'd ever seen. It had hoses that attached it to the kitchen sink, and you put the clothes through a sort of mangle. Then you pulled the sopping wet clothes out and carried them to the clothesline in the back garden. It was always freezing cold and, being an unwelcome guest, I was the one tasked with hanging the clothes and taking them down, usually frozen. Not one of my fondest memories of life in the UK. 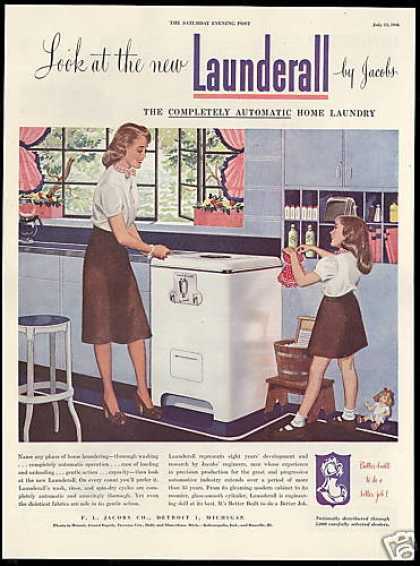 JULIA: While looking for pictures for the blog, I happened on an amazing account of laundry day in an unelectrified thatched roof cottage in the UK - in the early 50s! Go over to A Housewife's Work and have a read. It'll make you feel better about modern times, that's for sure. HALLIE EPHRON: Ah, laundry. My marriage has evolved to the point where my husband and I each do our own laundry (after I turned his underwear pink for the third time, and send a black crayon through the dryer, he decided my doing it wasn't worth the risk.) And he does the household sheets and towels. Sadly he cannot fold to save his life. Our "laundry room" is in a dark hole in the basement, but I could not live without it. When we moved in there was a clothes line in the yard which I never used. Julia, bite the bullet and call the electrician! JENN MCKINLAY: Laundry rooms are add-ons in our mid-century neighborhood. So, it's an out building attached to the house that has storage shelves and a washer, dryer, and the water heater. My goal this year is to modernize it, but that's after I put new vanities in the bathrooms, finish refreshing the kitchen cabinets, and painting all of the bedrooms. Ah, home ownership. Isn't it grand? I actually like having the laundry room as it's own entity. True confession: When the hooligans were toddlers, I used to hide in there sometimes just to have a minute or five to myself. RHYS BOWEN: When I was growing up we sent most things out to the laundry... Sheets, towels, shirts etc and it was just small stuff that got hung on the line. 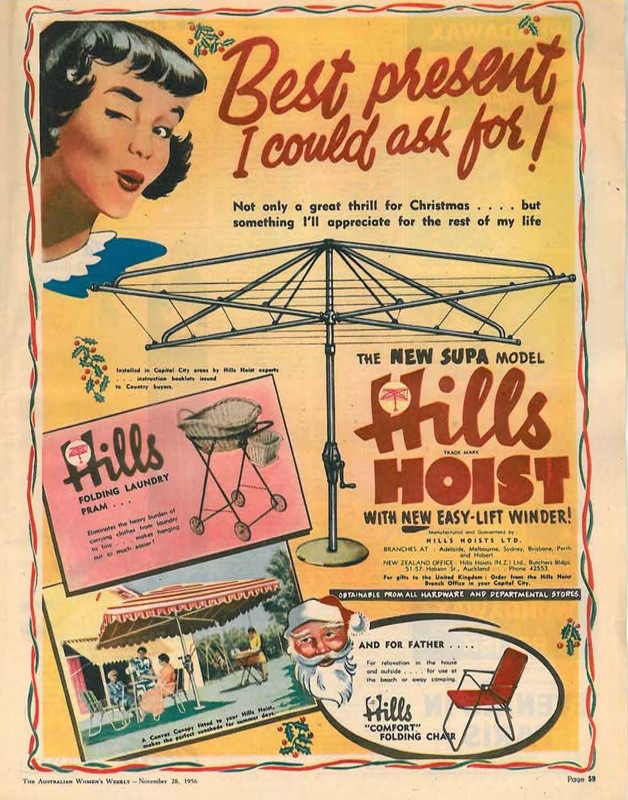 By the way, the Brits still swear by their clothes lines. They like clothing dried in fresh air. I don't know why clothes lines are not part of life in Arizona with over 300 sunny days a year. It would certainly save power. I have a small laundry room and a wonderful new washing machine. It's a top loader but he and uses very little water. The only drawback is it is so deep I have to stop toppling in to reach the last socks. However my dryer must be almost 30 years old and still going strong ! With just two of us at home laundry is easy these days. Unlike when we had 4 children at home, one of who,, who shall be nameless , would drop clean clothes back in the laundry room rather than put them away! INGRID THOFT: I do all the laundry because, for some reason, my hubby hates doing laundry. That’s fine by me; there’s something so satisfying about loading in dirty clothes and ending up with clean, fresh-smelling items. Even though there are only two of us, I feel like I’m always doing laundry for two reasons. One is that our washer and dryer are “condo-sized,” specifically meant for small urban living spaces, and therefore, don’t hold much. The second reason I feel like the washer is my constant companion is that working out most days of the week generates a lot of sweaty, exercise clothes. I wouldn’t have it any other way, but Rhys, I’m envious of your seemingly bottomless washer! HANK PHILLIPPI RYAN: I love doing the laundry. Yes. Ingrid, there are only two of us, too, so there's never too too much, and it is so gratifying! We have a big (old and unglamorous) basement, where there's and washer and dryer, and a big sink, and places to hang everything. And folding, I love that, too, is so mindlessly satisfying. And everything is warm and smells good. Julia, fix the washing machine. Or hey. Take the laundry someplace, and let them do it. It might be cheaper than fixing the washing machine. JULIA: So tempting, Hank. Whatever happened to the vans that picked up and delivered laundry? I know, gone with the milkman. How about you, dear readers? Time to come clean about your laundry! Ah, the joys of laundry days! Although the washer problem sounds as if the time has come to deal with it, Julia, having friends with washers to share sounds pretty awesome . . . .
We have a laundry room where, most of the time I do the laundry although John has been known to toss in a load or two himself . . . I simply manage to beat him to it most of the time. However, Monday laundry day has gone by the wayside around here. If the hamper is full, the laundry gets done and the day doesn’t matter. As far as the drying goes, although I like the idea of hanging clothes out and have done so for years, that seldom happens any more. It all simply gets dumped into the dryer . . . . I am fortunate in my friends, Joan! Laundry day is usually on the weekends. I guess it all depends on just how much laundry needs to be done. This past weekend, I had three loads to do. It's nothing particularly exciting. Just what needs to be done in order to have clean clothes. It doesn't become enjoyable or anything. It is just something that has to be done. One must have clean clothes. Wash, dry, hang up or fold, done. It's interesting how with the advent of modern electric washing machines and dryers, any day became washday. It was so strongly associated with Monday in the past, I found ads asking "What are you clothes like on Tuesday?" (for a brand of soap that promised no residue.) 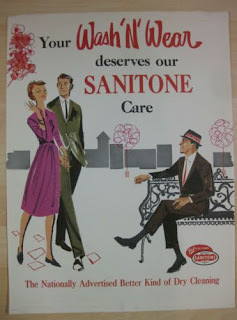 The question is nonsensical today, but everyone back in the 1930s would have known what the ad was about. In Louisiana, where I grew up, Mondays are red beans and rice day, because one could leave a big pot of red beans on the stove to simmer unattended while laundry was done. Some of my cousins still cook red or white beans every Monday, only now in the crock pot while they go to work. Interesting! I wonder if there are or were other regional wash day dinner specialties. My grandmother always had a pot of navy beans on the range while doing the laundry. It is still my fav comfort food. Since my mother worked in an insurance company office, she did laundry on Saturday. Which meant a big pot of chili simmering on the stove. I do all the laundry for the two of us, and every day I can I hang it on the clothesline. In fact, I'll plan to do the wash on sunny days if I can. I hang by order of whose it is and what kind of clothing it is, leaving things like kitchen towels toward the end. That way, when I fold as the item comes off the line, it's all ready to be delivered to its final destination. I find it efficient and satisfying (call be obsessed if you must), and yes, it uses free technology (I love that cartoon)! Edith I think you must live in a world of 48-hour days. In awe! The only laundry I do is towels and sheets. Weekly. And I’m good with that. 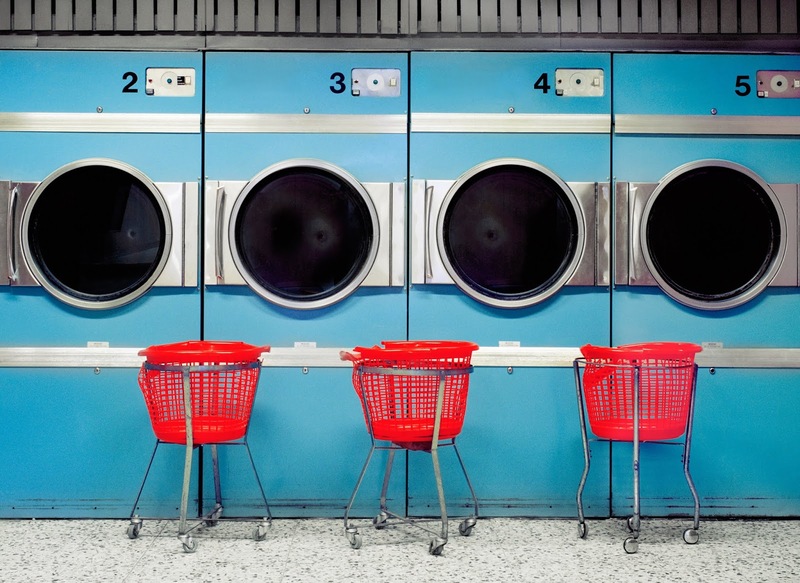 Count me among those who like to do laundry, but not at a laundromat. Reason for liking is that there is this big pile of stuff that gets cleaned up and neatened up while I am reading, sipping coffee, in my rocker with my feet up. Such a sense of accomplishment with so little effort. The laundromat requires effort! Deborah Crombie, my early memories of helping my mother and grandmother do laundry are of a washer like your former mother-in-laws. Mother's was attached to a water supply in the basement. Grammy's attached to the "settub" in the back kitchen. Hers also agitated the clothes with 2 toilet plunger looking things that clumped in a circle around the tub. I do miss hanging clothes on the line when the day is like you've described Edith. Finally, Julia, please, please for my peace of mind, get the electric fixed. Malfunctioning electricity is one of my "don't mess with this fix it NOW" things. I prefer this statement to labeling my thoughts as paranoid. Good thought, Elizabeth. I hadn't considered the "electrial things can be dangerous" aspect. When I was planning my house we couldn't fit in a laundry room and I absolutely did not want it in the basement. So what I wound up with is a largish bathroom with the washer and dryer there. My son had told me how wonderful it would be to pull out a warm towel from the dryer, not that I have ever done that but I do understand the appeal on frosty mornings! My washing machine is like Rhys', nice and large but very deep which can get tricky. I have never enjoyed doing laundry, and I count myself as one of the most spoiled women in the world because my husband does laundry for the both of us every week. Does he occasionally ruin something? Of course he does. And you know what I say? That it is a small price to pay for not having to do my own laundry. Susan I admire your Zen! Laundry in the basement--washer, dryer, sorting/folding table. I would rather have it upstairs, and I too envy those with a real laundry room. I would love having a laundry/mudroom with room for a big center island/table for folding and also for laying out my quilts. And a bank of south-facing windows where I could set up my quilting frames, and shelves for my sewing supplies. As you can see, I have given this a thought or two or a million! I will hang my laundry out to dry when I can, there are also lines in the basement for items I don't want to put in the dryer. But it seems to me, no matter how many loads I do, just when it is all sorted and delivered, I find a trail of dirty laundry creeping along behind me. Flora, there's supposed to be a famous headstone for a woman somewhere that reads, "Her laundry is finally done." Laundry, or "the washing" as my Nana would say, is pretty straight forward. There's just me and I'm an apartment dweller so that means using the building's laundry room. The machines are close to vintage so the settings are limited. I learned early on to use only the "gentle"/"cold" because all the other options delivered "ripped to shreds in boiling water". The dryers can be tricky too. Oh for a condo with my very own stacked washer/dryer combo. I can dream. Apparently "Pazuzu" has migrated to the west coast and lives on. I'll give it your regards. Like Hallie, my laundry room is in a dark corner of the dark scary basement. It isn't all that dark when I turn the lights on, but then I see all the cumulate crap that's crept in. I usually do all the laundry, including folding. We each put our own things away. I do that immediately but Julie tends to dress out of her laundry basket. To each her own. We have a clothes chute from the second floor to the basement, but it all has to be carried up when finished. When I was small, during the war, my mother and I lived with my grandparents while my father was in the South Pacific. My grandfather was a barber, which meant stacks of barber towels to be done each week. There was no laundry to send them out to nor money to do it, if in fact that would ever have been considered. The laundry room was a Maytag wringer washer with two rinse tubs, all on the back porch. Everything was hung out on the line, but on sunny summer days, my grandmother laid the white huck towels out on the grass to bleach. They smelled like heaven. In the winter, they went on the line to freeze dry. I bet now the health department would shut her down for laying them on the grass! A CLOTHES CHUTE! I want one... Does anything ever get stuck? Which gets me to thinking how one might use it in a mystery plot. Things can get stuck but there's a work around. It goes from a bedroom closet straight down thru the kitchen broom closet, and one can get to the blockage through that opening. But if I don't try to stuff something too big down it, like a quilt or comforter, it just goes straight to the basement. They are no longer legal as they can act as a chimney in case of fire. On the other hand, I don't throw lit matches down there ever! Hallie, I'd be delighted if you'd use my clothes chute in a plot. It ends in this box-like thing that has a screen door. Sort of looks like a rabbit hutch! Our house had a laundry chute, at one point, but some former owner blocked it up to create a small linen closet in the downstairs powder room below. However, they left the small door and the rest of the chute, so that when my kid were really little they thought it was great fun to throw things in there. Forever, since there was no way to retrieve whatever it was. I finally had a carpenter remove it and wall it over, about 20 years ago. Almost forgot it was there. Clothes chute! Charlie McNally uses one in Face Time—very funny dramatic! We had one in the house I grew up in, from inside the upstairs bathroom cabinet to a cabinet in the downstairs powder room right below it. My cousins and I loved to drip things down it. My parents built an addition to the house with a a real laundry room when I was about five. So funny I have no memory of where the washing machine was before that. A vague memory reading a story about children who slid down the clothes chute. Think it was in one of my aunt's books from 1920s-1930s. I remember wishing that my grandmother's house had one for me to try. I live in an apartment with a washer and dryer and zero kids, so laundry isn't a big deal. 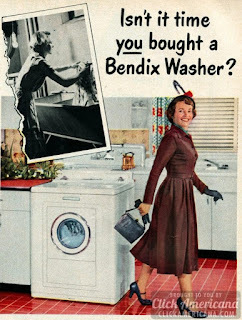 That said, it's not my favorite chore, but when I think about how people used to wash clothes I have nothing to complain about. I think of that all the time ever! When I start thinking wow, this is taking too much time, I realize how untrue that is! That is so true, Hank. We are spoiled! Laundry. Bah! Not one of my favorite things to do. Our laundry room is on the second floor along with the bedrooms and baths. We’ve three adults in our household and each does his/her own laundry. I wash and dry each load and dump it on a chair in my bedroom until I feel like folding and putting it away. One or another of us will wash sheets and towels when enough have piled up. No specific laundry day for us. It’s done as needed. Ramona, I finished high school in Louisiana. They always served red beans and rice on Fridays to be meatless. One of the things I do love about my laundry, even though I don't have a dedicated room, is that it's on the same level as the bedrooms. No lugging baskets up and down -at least if I use the dryer. Yes, me, too, Julia. I usually do a load or sort and fold when I'm getting ready for bed at night. The washing machine is in the basement with the furnace, oil tank, water heater, and pump for the well. This being even more rural Maine than Julia, the basement has a dirt floor, except for the cement slab on which the furnace and washer sit. There is no room for a dryer, even if I wanted one. Clothes go on the line or upstairs to drying racks in the spare room. This probably wouldn’t work well for a family, but for the two of us it’s just fine. And yes, I do habitually change the sheets and do the laundry on Mondays. Why mess with tradition? We are trying to get The Boy to do his own laundry. It's...a challenge. He's now gotten better about taking it down, but yes, if he finds something on the floor, it's much easier for him to simply throw it in the laundry basket rather than, you know, fold it and put it away. I hope to have him trained before he goes off to whatever is in store for him after high school. The Girl has been doing her own laundry for years, bless her. Mary/Liz, my teens were either one extreme or the other. The Smithie would throw anything that had touched her body for more than 15 minutes into her hamper. Youngest would let things pile up on the chest at the foot of her bed until I could SEE the waves of odor coming off them. "Just toss it into the hamper? How hard is that?" I would cry. (Every bedroom has its own hamper in our house. Teaching The Boy how to use the washing machine was like that scene where Annie Sullivan is trying to teach Helen Keller the word 'water.' The same thing over and over and over again, and he'd still ask if he could put his khakis in with his red sweatshirt. He gets his uniforms done at the base laundry now, thank heavens. Oh, Julia, The Boy reminds me of one of my daughters, who insisted for YEARS that I told her that yellow was a dark color. She's a smart girl, too. It defies logic. I am trying to teach both boys to do their own laundry. They're smart enough 'not to understand,' wink wink. But, good luck with that approach when they are on their own! I figure a few ruined favorite items will get their attention then. Julia and Karen: My boy is currently following the "everything goes in the same load on cold" philosophy. Okay, if that's what you really want to do. Don't say I didn't warn you. Just FYI, laundry is not the cure for writer's block. 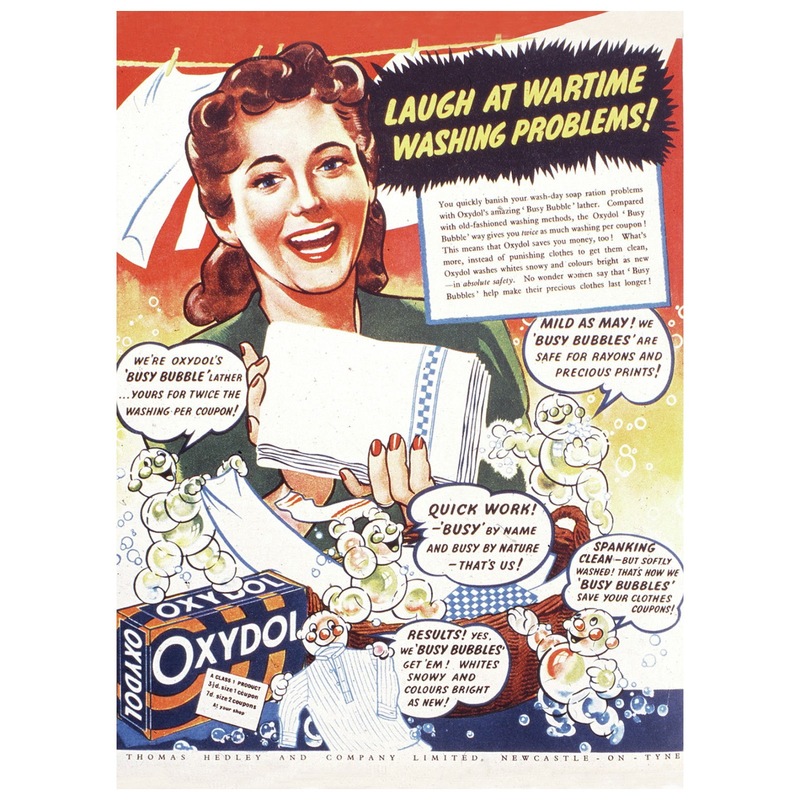 Writer's block just makes laundry more appealing, along with other tedious household chores. LOL. There are days I will even voluntarily clean toilets to avoid a stuck scene. What I love about doing laundry is that it can happen at any time, day or night, and it makes me feel productive with very little effort. Because I live alone and don't care if my house looks presentably tidy or not, I sort my clothes on the bathroom floor as I take them off at night. When the 'delicates' pile, or the 'denim and flannel' pile gets large enough, I tote it off to the laundry room--a real room with windows and cabinets and a built-in ironing board--and toss it into the washer. This can happen as I leave for work in the morning, or when the dogs get me up at 3 am for a potty break, or even at 10 am on a Saturday morning when I know I should be working but would much rather finish the crossword puzzle. See? I AM doing something! I'm doing the laundry! There is that, Gigi. Some days, when I feel as if NOTHING has gotten done and I've been interrupted during every attempt to be productive, I can look as a basket of clean, folded towels and think, There. Done. Yes, that sense of accomplishment with clean clothes...and finishing the crossword! Add me to those who have a black hole in the basement. I don't mind doing the laundry; as others have said, there's a nice satisfaction to finishing it and having it done, all clean-smelling and folded or hung in the closet. That being said, our dryer hasn't been working right for the past few months. It's too old to bother getting fixed, and I've put off replacing it because we're probably going to be moving before long. I actually love hanging out clothes on a nice day; I had forgotten what a simple joy it is to stand in the backyard on a nice day, listening to the birds while I do this chore. On the other hand, on a rainy weekend, I have no other choice but to put the clothes through the dryer several times or go to the laudromat (usually the former; I'm too lazy and cheap to drag everything to the laundromat and it takes too much of my precious free time. My daughter does her own laundry (by her choice) and I do my son's. My daughter and I argue over whose turn it is to do the laundry, and I somehow manage to turn a blind eye to her throwing everything into a basket instead of folding it! Putting the clothes away, though, that is one of the chores that I try to avoid :-) I put Jonathan’s things, all folded, on the bed, so he can’t get in until he puts them away! The first thing I loved about this house was the first-floor laundry room, created from the former maid's room (I always say it still is the maid's room). My now-34 year old daughter had just reached her first birthday, and it was miles more convenient to do laundry between the kitchen and family room than the icky, dark basement. It's very cramped, though, so in the new home we are building a priority was a bigger all-purpose room that will include laundry. I hang a lot of clothes, and have installed a rod behind the door for that; the new room will have a more efficient clothes rod and drying rack. And since we will have a first-floor master area, I plan to get a rolling basket thing to haul the laundry from one side of the house to the other. No more huge, broken plastic laundry baskets. Why is it impossible to make them so they don't crack, by the way? My mother had it rough when I was a kid, so I can't complain. I remember Saturdays so well, when she would roll the wringer washer to the sink and hook it up. She spent all day feeding clothes through the wringer, then hanging them all over the kitchen to dry. 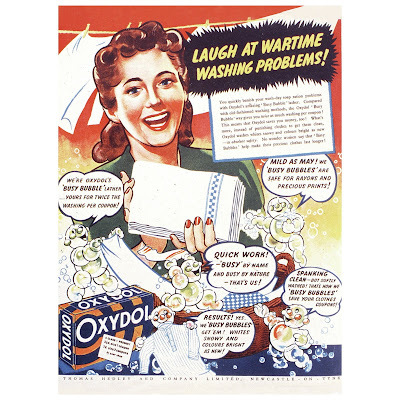 I can still smell the Fels Naptha she used as soap. 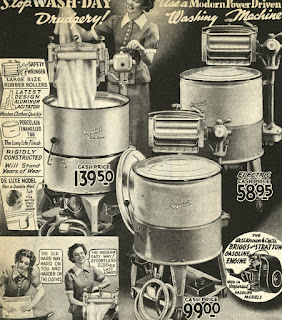 My aunt had a wringer washer, too, and she had long, almost waist-long hair. She was in the basement once, doing the laundry, and got her hair caught in the wringer, which yanked her clear up to the rollers, stuck there for hours, unable to free herself. By the time my uncle got home to release her, she had to cut off all her hair. For the next forty-some years of her life she never afterward had hair longer than two inches. Karen, that is the most horrific story I've ever heard. Seriously, it sounds like a Stephen King novel in miniature. I know, right? It traumatized me, and I wasn't even there. We later lived in that same house, and that basement scared the wits out of me. No no no no no. xox Ah. Here's a question: Do people still separate colors from lights? I read in "Real Simple" that it isn't necessary after an initial separate washing of an item that might bleed. It's ingrained in me to sort into separate loads, although I have friends with kids who just throw everything together in the interest of time. Thoughts? Hub does our laundry and the Hooligans do theirs - I’m pretty sure there’s no separating happening there. LOL. I only do towels and sheets once a week. No separating there either! I'm a total segregationist. Whites, lights and darks. Part of that is because I like to bleach my whites, and part is because my machine is old and has basically two settings, VERY cold or hot hot hot. Yes, I separate. And I bleach our white sheets and towels, so always do them in separate loads. I separate color clothes from the whites, but that's the extent of my "separation anxiety". Unless you count the sheets and such getting done separately from the clothes. Not separating the lights from the darks would trigger such an anxiety attack. I'm not willing to risk it. NO - I just throw it all in and everything comes out just fine. People wear white? No, seriously, I throw it all in together and it's fine. Of course, most of my clothing is dark so it probably wouldn't matter much. Okay, once I didn't-- with great fear. But I was n a rush. ALL FINE. Even so, I still separate. Deana, you're just not trying hard enough! 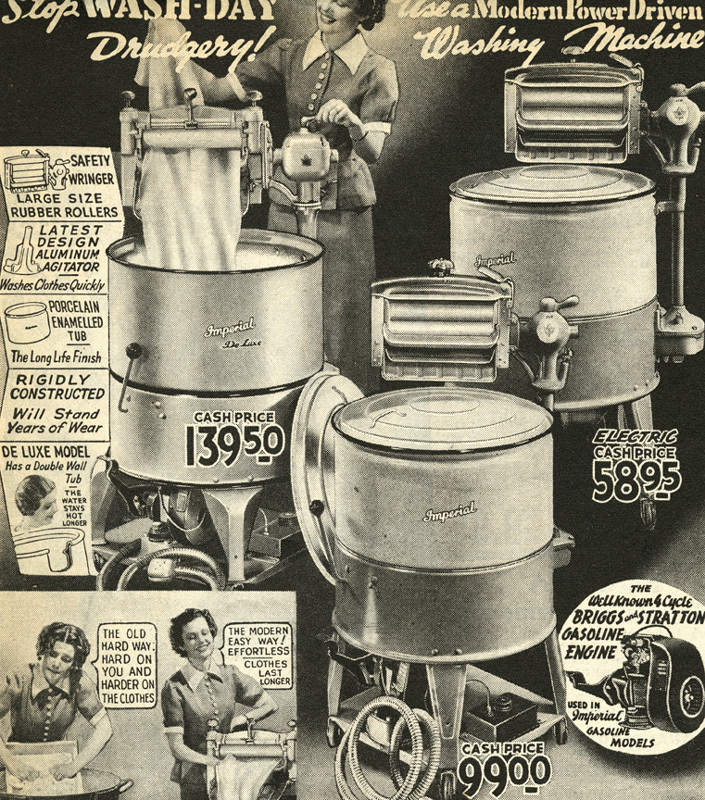 Julia, the Maytag in the last photo looks like the machine my mother-in-law had! But I keep going back and drooling over the photo of the perfect modern laundry room. Sigh, not in this house, but mine would be a whole lot better if I would just find the time to give it a good clear out and reorganization. What's the blueing? That is so evocative! I live alone now and do laundry on an as needed basis. Washing and drying is easy...folding, not so much. I’ve been known to throw a wet towel in with already dried clothes to reduce the wrinkles. I don’t usually mind ironing and occasionally set up my ironing board out the patio so I can enjoy the weather. My laundry room has access to the patio and includes a shower and toilet for the convenience of those using the pool. The room is not heated and when you finish showering on a cold day, wrapping up in a big towel fresh from the dryer is the best! I live alone now too and I do the laundry when the basket fills up enough to do a load. But I am completely uninterested in whether my clothes are wrinkled or not. I get them out of the dryer and hang them up as soon as I can but I have nowhere to go and no one to impress that I need to have crisp unwrinkled clothing. The stuff is clean and on my body, that's good enough for me. If I was actually a detective, I'd likely be called "The Rumpled Detective". When in collage and after, for many years, it was the laundromat, which wasn't nice or not nice, just necessary, and doing the laundry a chore. When I finally lived in a house with washer and dryer, they were in the garage, which was fine if somewhat inconvenient. My mother, who lived in an old house in Laguna Beach, CA, had no washer or dryer so she took her laundry to the Wash 'N' Fold. Drop it off Monday, pick it up Wednesday, folded, in plastic, and they did her dry cleaning too. Convenient, but a little pricey. Now, in our 1996 home, we have a nice laundry room placed between the garage and the bedrooms and kitchen, it has two huge Speed Queen front-loading machines, the tops the right height for folding, there's a huge laundry tub, lots of counter space and cupboards for the soaps, towels, sheets, etc. My wife does the laundry, but I can if needed. I do the putting away of my stuff, most of it on hangers or rolled. We do laundry on Fridays, for no particular reason. With my husband having lived elsewhere for fifteen years, he learned to do many things, including laundry, himself. He's semi-retired now and living at home, but he continues to do laundry. He loves doing laundry, so he does his clothes, sheets, towels, and blankets. However, he doesn't touch my clothes upon threat of losing important body parts. He has proved himself to be a danger to my clothes. Recently, before Bouchercon, our washing machine went kaput, and hubby took things to the laundromat. Oh, my! He fell in love with the laundromat, doing the folding there and even helping the person-in-charge there. I just shake my head and laugh. Whatever makes him happy. He bought the new washing machine while I was at Bouchercon, which I thought would be okay as I had talked to the owner of the store (we've known him for ages) earlier in the summer and told him what I liked. Well, of course, I came home to what my husband picked out, which is okay, but not what I wanted. Lesson learned. Don't leave this matter in his hands. Hubby is gone right now for his part-time work and I'm trying to make sure the laundry is all done up before he gets home. But, he will still get to enjoy doing his clothes he brings home. We do have a laundry room, but it is nothing to brag about. There is plenty of room in it, but it has become part storage room and collect all. My dream is to make it into a well-ordered, pretty place that is a delight to walk into, and to use part of it for a half-bath, as it is off the family room. I especially like the picture of the laundry room you posted, Julia. I don't have a "laundry day", I just do it whenever I get around to it. When I was a kid we would get some of the dirty mom & dad clothes and play dress up, put on dad's work boots, walk around a while and have fun before Mom washed them. 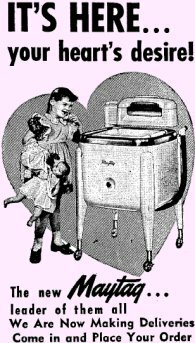 We had a wringer washer when I was very young, but we got an automatic washer when I was around 5 or 6. We never had a dryer. We would put Dad's Levi's on pants stretchers and then hang them on the line - they came out stiff as a board with no wrinkles. Then we would have to iron them. We hung everything up on the clothes line. We had a clothes pin bag with a wire hanger on the line and we brought it inside when the pins had all been collected so it wouldn't get faded out hanging outside. We sprinkled the clothes, rolled them up, and put them in a hamper to iron the next day. 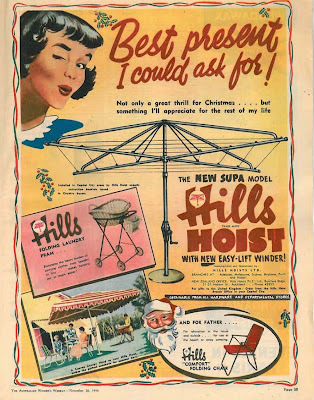 We ironed Dad's underwear, pillow cases, sheets, dish towels, everything! My grandma had a clothes chute which I wish I did since the washer and drier are in the cellar. Mom got bursitis so we've had a drier for years. When the garden was redone, the poles and clothesline was taken out. I have lines in the cellar for the few things that don't go in the drier. Mom used to say I was "folding challenged" but now I'm alone, who cares. Also haven't ironed since Home Ec. Jay, the rumpled look worked for Columbo.